When you think of AGS, no doubt our dove logo, white boxes and red trucks spring to mind. Reinforcing our environmental commitment, however, we want to announce that one of those icons is being updated! 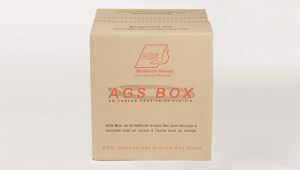 AGS’ boxes are understandably close to the hearts of our staff and our clients. Countless journeys have started with households’ possessions being gently packed into them, and their unique white colour is symbolic of AGS’ commitment to quality and professionalism. Now, however, we are proud to reveal that AGS’ packaging materials – including our boxes – will be phasing over to a brown colour, while guaranteeing the same level of protection and security on which AGS’ reputation is based. As much as we loved our white boxes, AGS’ new packaging will not require bleaching, and is therefore in line with our global commitment to environmental sustainability. Rest assured that all our packaging materials continue to be stringently quality-wwwed, delivering the same high levels of protection. Learn more about AGS’ packaging solutions.